Antenna Beetles (カマドフマ?, lit. 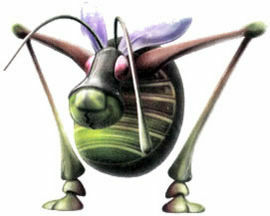 : "Cave Cricket") are creatures in Pikmin 2 that can pose danger to Pikmin, but not directly. They use their wings to produce sounds of a high pitch, which interferes with the Treasure Gauge and attracts Pikmin, much as the leaders' whistles do. That effect overrides any similar commands issued by Olimar, so they are able to take command of any Pikmin that are nearby; the only way to regain control of them is to kill it, or force it into leaping away again. Having Pikmin captured is where the danger comes in, because this creature may lead them into a hazard. The beast periodically jumps away and returns, stumbling as it lands, and can be led into disembarking in such a manner by attacking it. Approaching the beast often has a similar effect. In attack, it can be swarmed as it lands or have Pikmin thrown on top of; Purple Pikmin work the best, as they may stun it, preventing it from getting up and jumping away. If Pikmin lands on it, it will roll over, not much different from an Anode Beetle. The Antenna Beetle is relatively rare, found in only a few underground locations. The Treasure Gauge being dysfunctional (the needle fluttering about and flashing a pinkish color) is an absolute indication that one is on the same sublevel as the leaders. ↑ This enemy cannot be delivered to Onions in-game. This information is obtained from the game files. The creature is called Antenna Beetle due to it "whistling" an area around it, perhaps using its antennae, or perhaps because it mimics the way a spacesuit's antenna shakes when a leader is whistling. In Japan, its name is カマドフマ?, which is similar to カマドウマ?, or a cave cricket. Its scientific name is Mesmeri raiocontra, and in it, mesmeri is similar to the English word "mesmerize", and raiocontra could be considered a combination of raio and contra. Raio, in this context, is Portuguese for "beam", and contra is Latin for "counter", maybe referring to how the whistle's "beam" is used to counter the Pikmin's aggressiveness. Internally, the creature is called fuefuki, which in Japanese is ふえふき? (lit. : "Flute Player"). The Antenna Beetle in the Piklopedia. An Antenna Beetle attempting to attract Pikmin. The creature's e-card, #38 (4th yellow card). The Antenna Beetle was meant to be included in the Roulette Wheel in Pikmin 2's 2-Player Battle mode, along with the Spotty Bulbear, and the Fiery/Caustic Dweevil. This page was last edited on March 31, 2019, at 18:54.